I have been playing around a lot recently with longer shutter speeds. Tonight I found myself arriving home at twilight, and the cat *really* wanted to go outside for a while (she does not get to prowl unsupervised). So it was a win-win for us both. She got go out and hang around with me, and I got to try some low, low light shots with loooong shutters. I only took four or five shots, and the results were not great, but I admit to being inspired to try some more another time. - ISO 640. I was hoping for 100, but could not make it work without going to 'bulb' with the shutter. - Shutter was 30 seconds. To use 'bulb' I need to use the remote trigger (which is at the studio). I expect that will happen soon! 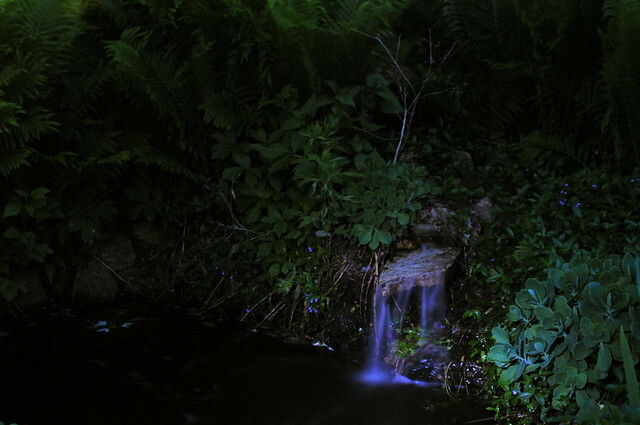 - I wanted the waterfall to really pop, so I hit it with an LED flashlight for approximately 4 seconds. It made things pretty blue, so I adjusted the tone just a bit. Some blue was what I wanted. It also had a wider field than I wanted, but it was what I had on hand. A paper towel roll will make an effective snoot for it. I am thinking that I would like to try this same shot with a single small candle tucked behind the waterfall. Perhaps I would also 'paint' the surrounding foliage with light for 2-3 seconds to bring them out a bit. Awesome! Are you downstream from the Springfield Nuclear Plant? Oh, Nataraj! That's STUNNING!!! I want it for my wall!!! !